The Tödi takes part of the Trans Alp Route. The previous tour, the Urner Haute Route, ended in Engelberg. From this village you have to cross the E35, the route to the Gothard tunnel, in order to get in Disentis, the starting point for the Tödi. The tour will round the outstanding peak of the Tödi in 5 to 7 days and ends in Sumvitg, about 12 km East from where you left. 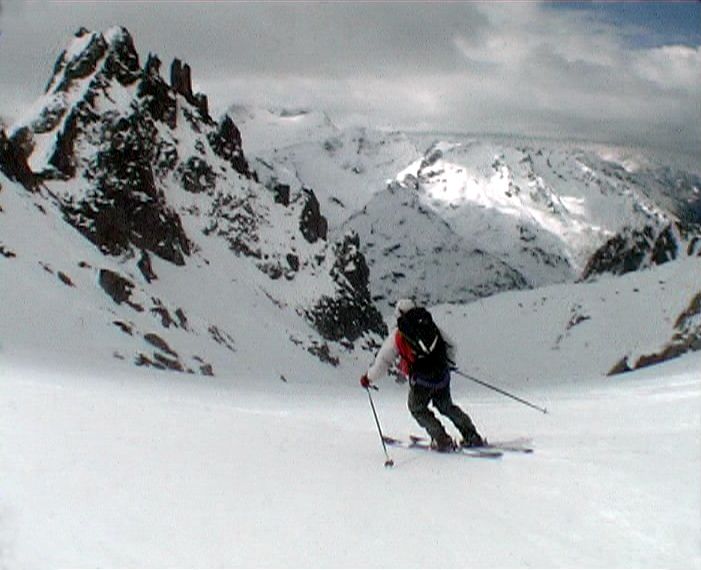 On the first day you can have a gentle start by taking the ski tow to an altitude of 2800 meter. From there you can enter the mountain area by crossing the ridge of Piz Ault. The surrounding mountains are partly very quiet. So quiet that, though it was already March, we where the second visitors of the Hüfihütte that season. This hut is, of course, unguarded even as Camona da Cavardiras and the Camona da Punteglias. When you follow the route in the suggested direction you will have two unguarded hut on de first- and second day and the Cap. Punteglias on the last day. The Fidolins hutte is very popular for climbing the Tödi. Especially in the weekend. It can be completely booked! The climbing of the Tödi is very rewarding due to the magnificent scenery of the Bifertenfirn (glacier) which have to cross. Beside of the glaciers you have to take in consideration that you also need a rope for descending two cols. The minimum required skill level for this tour is S (difficult). The alternative routes are even more challenging, see the map below. The map is coming soon. The red colored routes is the suggested tour. The yellow routes are alternatives, also described in the tourplan. The Hüfi hütte, Camona da Cavardiras and the Camona da Puntegliasis are open but unguarded during the tour ski season. For additional information you can click the link. On request you can receive a DVD of this tour. The Tour Plan is written in English.